The Woodland by Natalie Lymer for Lecien. 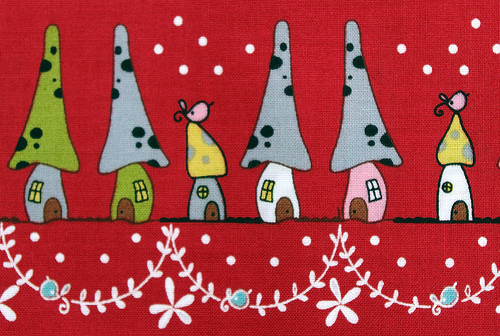 Woodland is a fun collection with six different designs in up to seven different colorways; an adorable collection depicting a tiny toadstool village, curious fairies, little girls and birds. With thanks to my sister, Karen, who gave this FQ bundle of Woodland to me after her recent trip to Quilt Market in Houston. Yardage of this range is expected to hit the stores in December 2011. 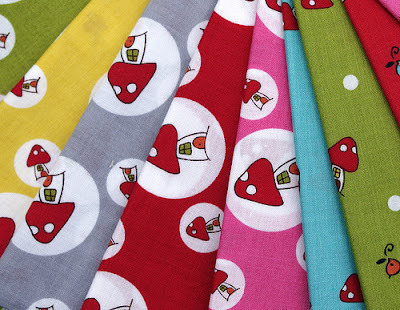 Very cute prints and bright cheerful colors. These are very cute - I am glad you like them. Happy sewing. Adorable. I love the colorways too. Gah! I keep finding fabric that I must.have.right.now and they're not available yet. December/January could be very dangerous with some of the new collections coming out. I can't wait to see what you make with this! So adorable!!! This just went to the very top of my wishlist!! This line is just too cute! You're so lucky to have scored a FQ bundle before the official release! My husband said I am not allowed (ha! ha!) to read your blog anymore because it costs him money. 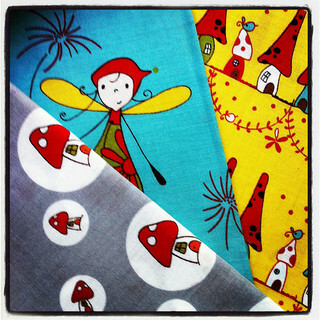 I always want to buy all the fabrics you feature! But, thanks for showing me fabrics I might not otherwise have found. Omg I die! So cute! 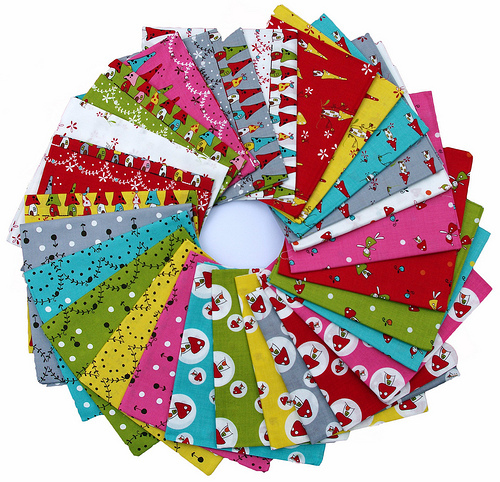 I want a Christmas-y quilt of all of these! !